Getting us started was Honeybee and Sonic, playing two of the mixiest characters in the game: Flash and Black Canary respectively. After going up the first 2 games, Honeybee was looking to be in the best shape he's been in for a long time. Sonic wasn't going down without a fight, he finally got something going in game 3 with a win. The loss prompted Honeybee to immediately switch to Dr. Fate, a bad MU for Black Canary, I don't care what anyone says. To be clear, I am not an expert, and Sonic is the one saying Canary beats Fate, proving it by putting another game on the board. Honeybee flipped back to Flash, but Sonic was the one to take the set 3-2, reverse 3-0ing Honeybee. Next on the agenda was possibly two of the last character loyalists left in the game, Hayatei vs. Grr. After a close game 1, Grr took the first point with some good placement of Atom's poison gas. Game 2 went down to the wire, Hayatei's Robin was on the verge of a real master comeback. Was too much work against the Summer Jam champ, Grr was able to secure game 2 as well. Hayatei channeled the true spirit of Canada for the next game, and finally got a game for himself. That momentum carried him forward into a game 4 win and another game 5, where Hayatei secured another reverse 3-0 and defeated Grr 3-2. 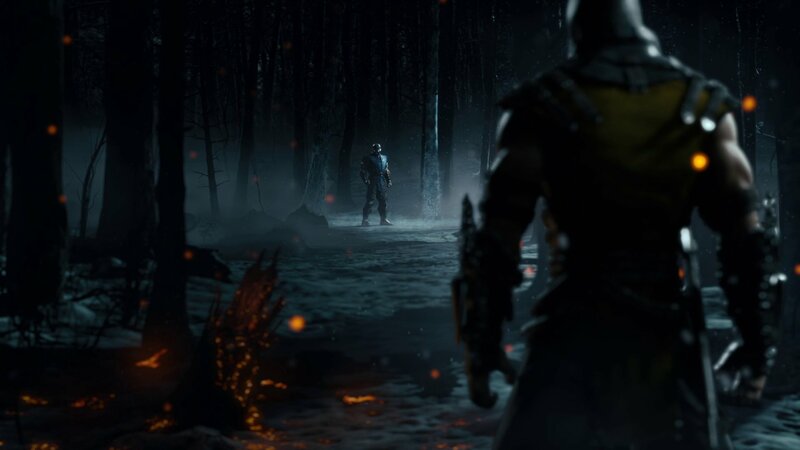 For our first match in Loser's, Rewind and Tweedy played, making this the first major since Combo Breaker where two of the three Noble NRS players couldn't make Grand Finals. 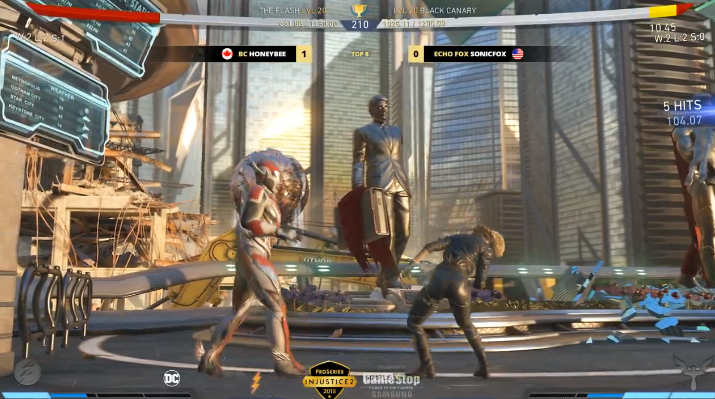 Tweedy's Starfire went to work against Rewind's Catwoman, with Rewind taking game 1 after a rough start. 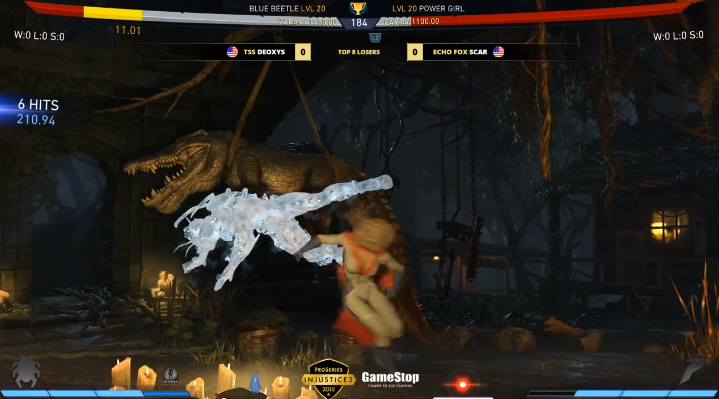 Rewind also took game 2, making everyone question whether or not Starfire actually needs buffs. Rewind had too much momentum going at this point for Tweedy to stop, and he took game 3 and the entire set 3-0. 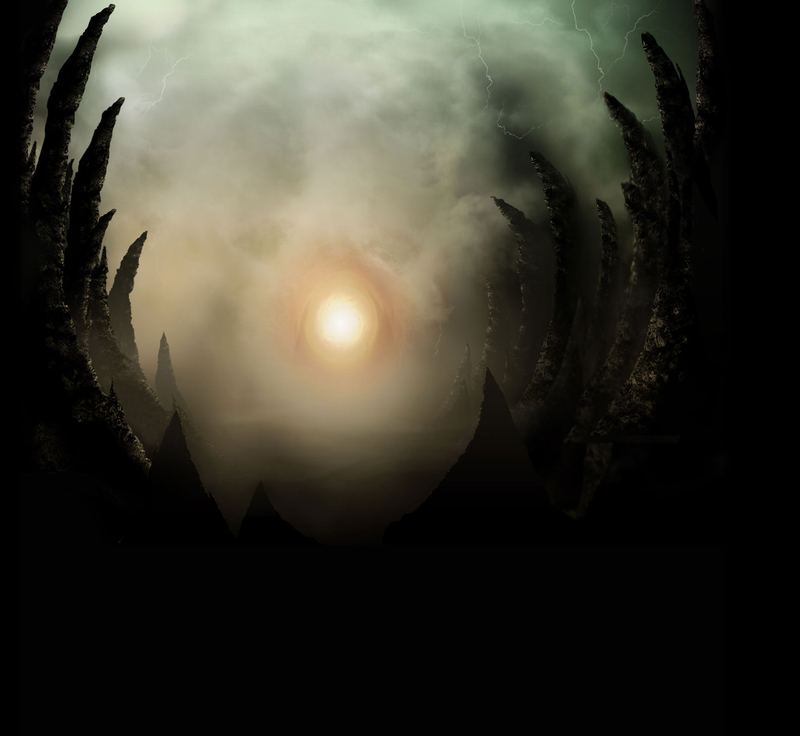 Following that was Scar against Deoxys. Deoxys was still repping Blue Beetle while Scar tried his hand with Super Girl in this first game. Deoxys went up two game, prompting Scar to bust out has patented Brainiac, who finally got him a point on the board. The loss pushed Deoxys to swap to Cyborg, who secured the final game for him, giving Deoxys the set 3-1. Out next match was EVO Champ vs. Summer Jam champ, Rewind vs. Grr. Playing Catwoman and Atom respectively, Rewind took games 1 and 2 rather handily. Grr rallied hard for game 3, taking out Rewind without losing a health bar. Game 4 went back to Rewind, who took the set 3-1, advancing through another round of Loser's. After that was the return of the Flash Godlord against the Blue Bomber Beetle (Honeybee against Deoxys). After a drawn out round 1, Deoxys found his groove and secured game 1. After a color swap, Honeybee's blue Flash defeated the Red Beetle for the game 2 victory. After another color swap, Honeybee was still able to take a game as the red Flash, going up 2 games and putting himself at set point. Facing elimination, Deoxys pulled out his Cyborg to try and stop Honeybee's momentum. Honeybee was apparently ready for that matchup, he took the next game and the entire set 3-1. Back to Winner's, Hayatei's Robin and Sonic Fox's Canary. Sonic threw Hayatei right into the blender, destroying his healthbar and taking two games faster than it took me to type up these two sentences. After taking a breather and hitting his notes, Hayatei slowed things down and finally took a game off of Sonic. Sonic just dialed the Canary Blender up from Smoothie to Obliterate and took the set 3-1 in game 4, securing his spot in Grand Finals. Playing for the right to face Hayatei in Loser's finals was now Rewind and Honeybee. Changing things up, Rewind played Black Adam against Honeybee's Flash. Rewind took game 1, Honeybee didn't look too phased by the loss. After Rewind took another game, Honeybee looked a bit more phased, but opted to stick things out with the Flash. 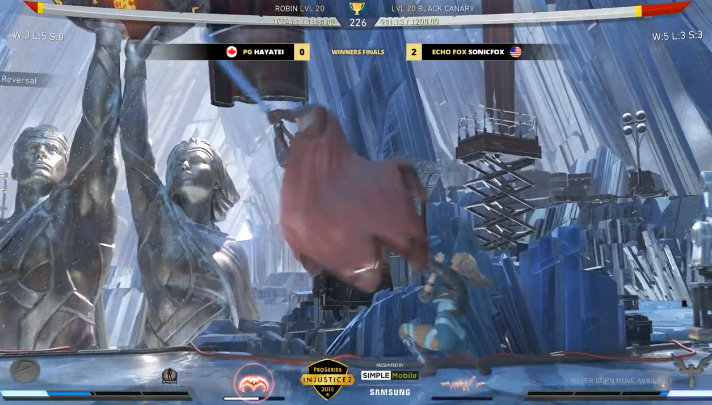 The might of Kahndaq ended up being too much for the fastest man alive, Rewind won the set 3-0 and advanced to Loser's Finals. In another first, Rewind decided to play Dr. Fate against Hayatei's Robin. Despite being what most people consider a bad MU, Hayatei swung hard for game 1 and took the first match. The loss prompted Rewind to hop right to the character select to try Catwoman. After Hayatei took another game, Rewind dug through his character history to try out his Batman in the hope of saving his tournament life. Finally getting a game on the board, Rewind's decision would have to carry him another two games if he wanted the win. After an insanely close game that came down to a final hit, Hayatei took the set 3-1 and got the rematch against Sonic Fox in Grand Finals. Our Grand Finals between Sonic and Hayatei went down in similar fashion to their match in Winner's Finals. Sonic mixed away Hayatei's health bar with Black Canary, but this time Hayatei was able to make some reads and prevent Sonic from running away with the set free. Sonic was able to win a close game 1, Hayatei returned the favor with a close game 2 win. After being down on health for most of the next game, Sonic came right back to win game 3. If Hayatei was going to lose, he wasn't going easy, taking game 4 and putting both players on tournament point. In the end, it was Sonic who took the final game, winning the set 3-2 and becoming the SCR 2018 champion. There you have it, that's SCR2018. 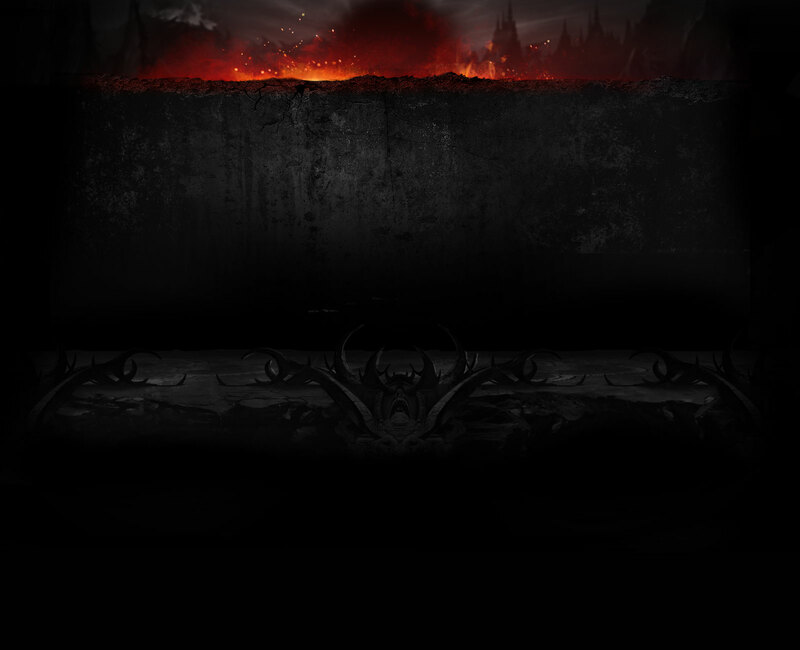 It's also the final event of the Injustice Pro Series before the Last Chance Qualifier, we'll do a post on who's officially locked in once we have the points update for SCR. Congrats to the Top 8, and see you all in a few weeks! Congraulations to Sonic for the emphatic win! He has done the Black Canary community proud. Canary vs Fate is a 6-4. Sonic clutched it out several times in this tournament, starting with Hero Killer Stain. Great performance. 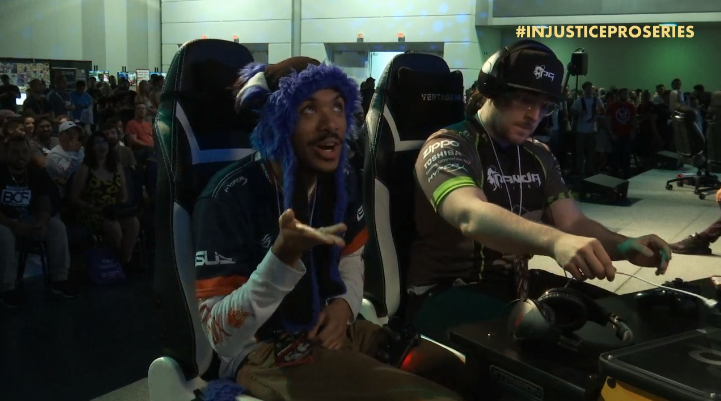 Huge kudos to Sonic Fox for the win. Cool to see Black Canary talking the tourney. I don’t care if Injustice 2 tourneys get five or five hundred entries, I’ll watch them all. This was such a fun tourney with a diverse top eight. 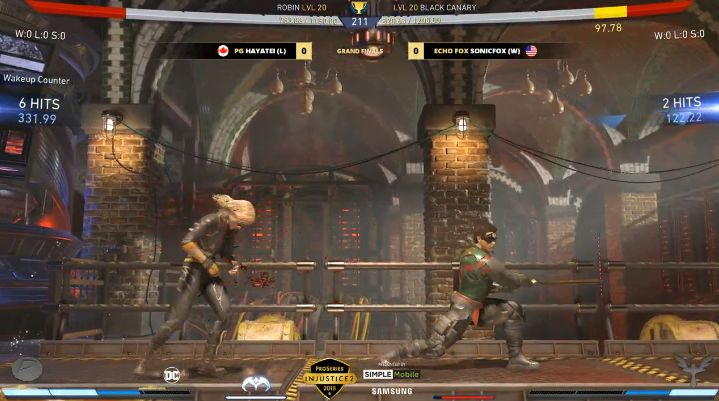 There’s been so much crying about Fate and Starfire, zoning, and top tiers, yet the Grand Finals was Robin vs Black Canary. The pools, top eight, and grand final were so much fun to watch. Fun tourney, great game. I'm waiting for Sonic to win a mojor with Grodd and I can say I've seen it all.